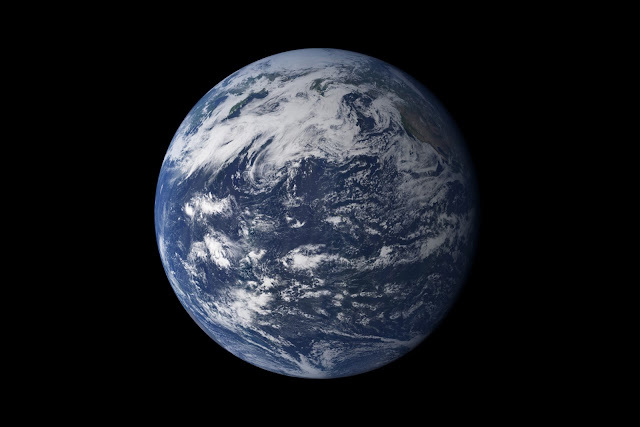 This detailed, photo-like view of Earth is based largely on observations from the Moderate Resolution Imaging Spectroradiometer (MODIS) on NASA’s Terra satellite. It is one of many images of our watery world featured in a new story examining water in all of its forms and functions. “In all, the Earth’s water content is about 1.39 billion cubic kilometers (331 million cubic miles), with the bulk of it, about 96.5%, being in the global oceans. 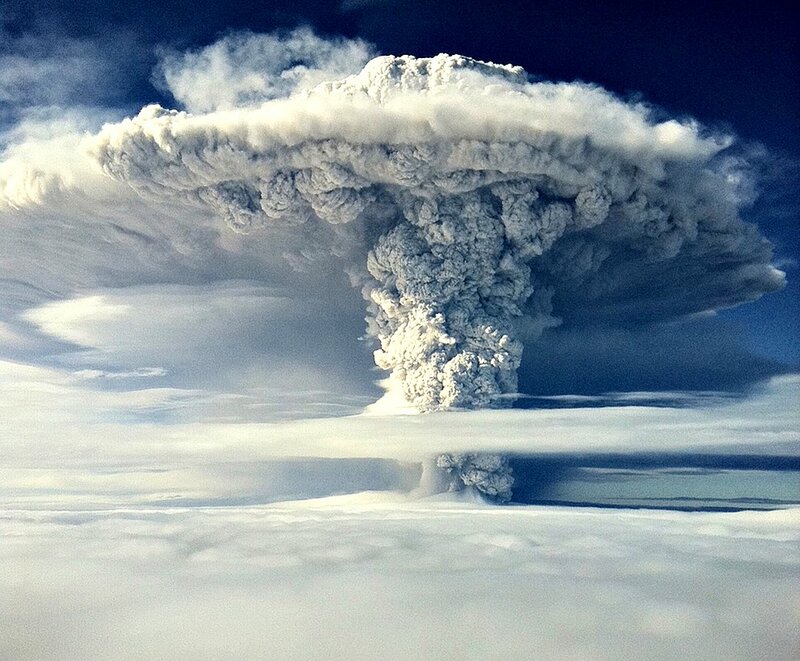 As for the rest, approximately 1.7% is stored in the polar icecaps, glaciers, and permanent snow, and another 1.7% is stored in groundwater, lakes, rivers, streams, and soil. For human needs, the amount of freshwater for drinking and agriculture is particularly important. Freshwater exists in lakes, rivers, groundwater, and frozen as snow and ice. Estimates of groundwater are particularly difficult to make, and they vary widely. Groundwater may constitute anywhere from approximately 22 to 30% of fresh water, with ice accounting for most of the remaining 78 to 70%." 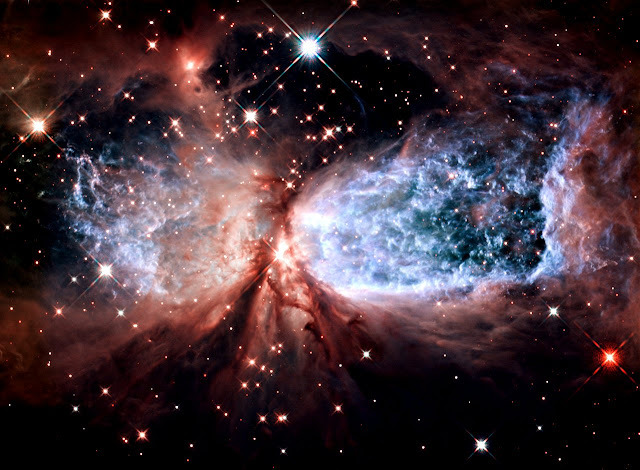 The bipolar star-forming region, called Sharpless 2-106, looks like a soaring, celestial snow angel. The outstretched "wings" of the nebula record the contrasting imprint of heat and motion against the backdrop of a colder medium. 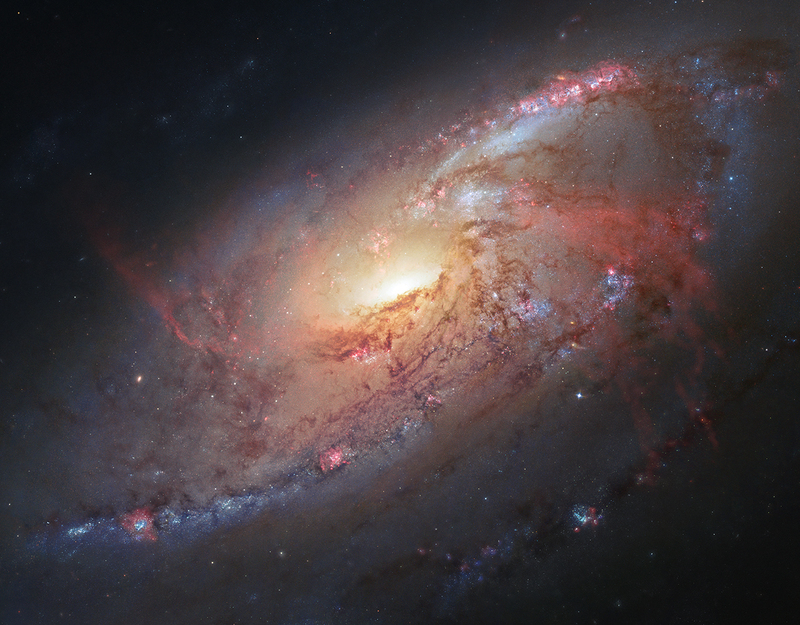 Working with astronomical image processors at the Space Telescope Science Institute in Baltimore, Md., renowned astrophotographer Robert Gendler has taken science data from the Hubble Space Telescope (HST) archive and combined it with his own ground-based observations to assemble a photo illustration of the magnificent spiral galaxy M106. Gendler retrieved archival Hubble images of M106 to assemble a mosaic of the center of the galaxy. He then used his own and fellow astrophotographer Jay GaBany's observations of M106 to combine with the Hubble data in areas where there was less coverage, and finally, to fill in the holes and gaps where no Hubble data existed. The center of the galaxy is composed almost entirely of HST data taken by the Advanced Camera for Surveys, Wide Field Camera 3, and Wide Field Planetary Camera 2 detectors. The outer spiral arms are predominantly HST data colorized with ground-based data taken by Gendler's and GaBany's 12.5-inch and 20-inch telescopes, located at very dark remote sites in New Mexico. The image also reveals the optical component of the "anomalous arms" of M106, seen here as red, glowing hydrogen emission. Robert Gendler is a physician by profession but has been active in astrophotography for two decades. Robert started taking astro-images from his driveway in suburban Connecticut. He then spent several years imaging remotely from places like New Mexico and Western Australia. More recently, Robert has been spending his time assembling hybrid images from multiple data sources including the Hubble Legacy Archive. This portrait of M106 contains only the inner structure around the halo and nucleus of this Seyfert II active galaxy. Large amounts of gas from the galaxy are thought to be falling into and fueling a supermassive black hole contained in the nucleus. Also known as NGC 4258, M106 lies 23.5 million light-years away, in the constellation Canes Venatici. Still looking for that comet? Comet PanSTARRS (C/2011 L4) naked-eye appearance in the northern hemisphere is described by successful comet spotters as a dim star with faint a tail. If you want to catch it the next few days could be your best bet. Start looking low and almost due west about 45 minutes after sunset. Of course, clear skies and a pair of binoculars should help a lot. Sky photographer Jean-Luc Dauvergne found suitable weather and western horizon for this comet and crescent Moon portrait after a road trip on March 13. 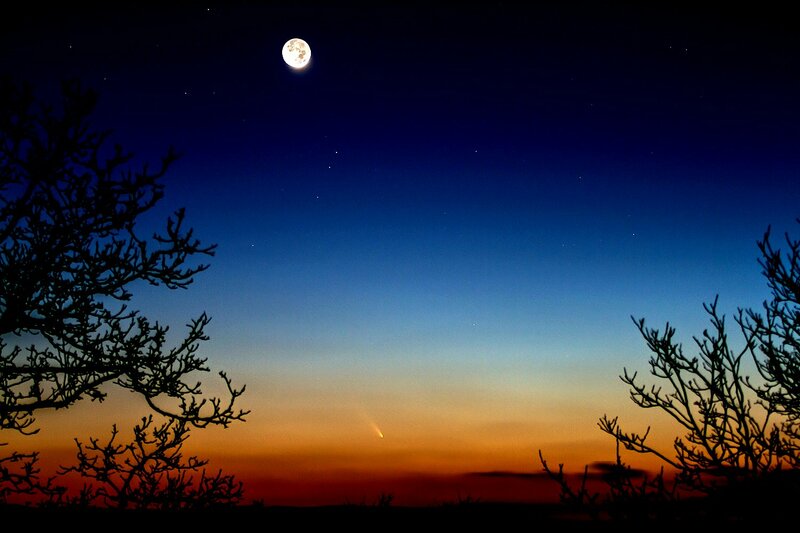 Seeing PanSTARRS for the first time, he recorded the beautiful twilight scene with a telephoto lens near historical Alesia in France.